When Megan and I chose to live where we live, I was excited. We were going to be renting a house. I hadn't lived in a house year-round since I left my parent's place in 1997. Megan was an apartment dweller during that period as well. Well, mowing the lawn and tending to the weeds got old fast. I thought I'd be into the gardening, mowing the grass, and I thought I would wash my car every week in our driveway. None of that really has come to fruition! What has drawn my attention? 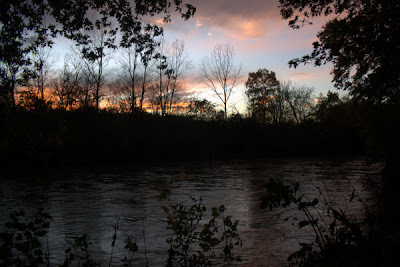 Credit the Olentangy River and the green corridor that is a stone's throw from our house. Last fall I only discovered just a small little bit of what the river and linear forest bisecting our great city had to offer. 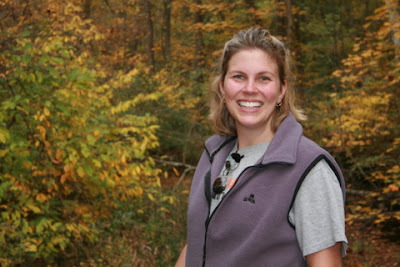 In 2007, I've taken full advantage, trying to uncover every rock, photograph each organism, and for that matter, practically every inch of space. So it has been fun. Yes, we live in a hole, some of the houses up the street are a bit iffy, but it has been fun. Thursday evening and Friday afternoon I took full advantage of the goodness that surrounds our house. 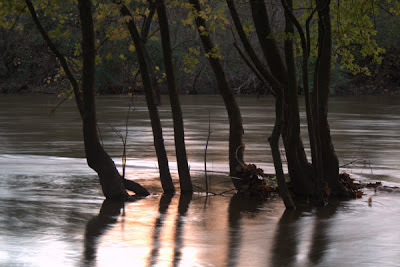 We had quite a bit of rain this past week, and the Olentangy was swollen. Couple that with a decent sunset, and there were several photographic opportunities to be had. 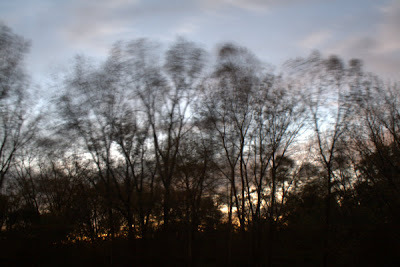 In the photo below, I set the camera on my tripod, set a very small aperture and very long shutter speed, say about five seconds, to create the blurring effect seen here as the cottonwoods swayed in the stiff evening breeze. Although we had a clearing Thursday night at sunset, clouds moved in for Friday and I had to look hard for decent photos Friday afternoon. 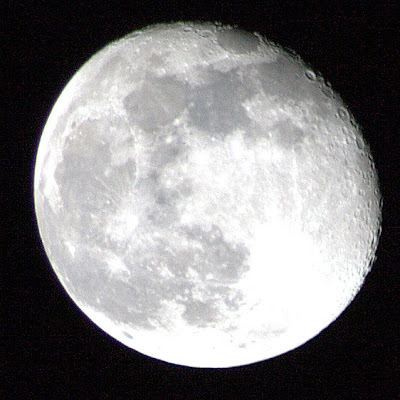 Its too bad I don't have faster lenses, that let more light into the camera. I have to compensate by using a high ISO setting which leaves the resulting image fairly grainy, but it allows me to record what I'm seeing. Alternatively, I can use a tripod. 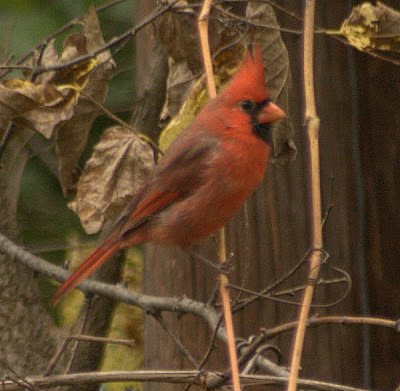 This male cardinal was hanging out amongst some dried grape vines. 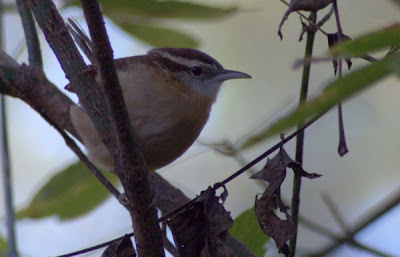 These birds love scrubby habitat, and are ridiculously abundant around our house. We also have bird predators, like this cooper's hawk. My neighbor calls it a falcon. I've mistaken them for peregrine falcons before as well. But most likely, if you see a small hawk in a neighborhood, its a cooper's, and it is looking for birds near feeders. 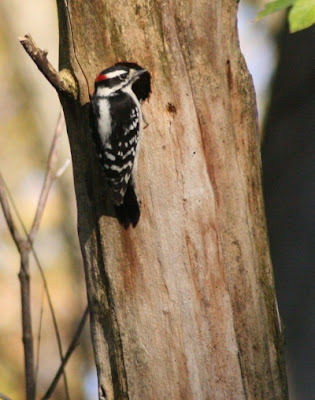 This one alighted on top of the black walnut tree. The house sparrows spotted the bird, and everything went silent. I tried to find an angle where I could get a nice profile shot, was unsuccessful, but before the bird swept out of view, I fired off a few rounds of the camera and came up with this shot. 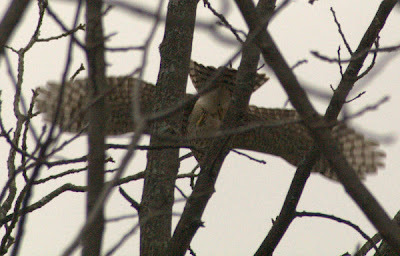 Saddened that I couldn't get better shots of the cooper's hawk, I headed towards the park and to the river. 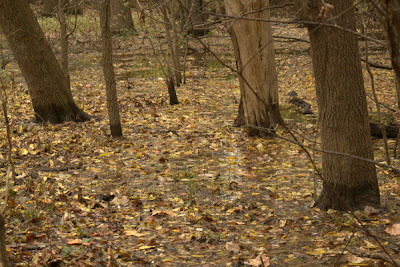 The floodplain was wet, and I wore my calf-high boots. Areas like this are flooded by runoff from the parking lot at Graceland shopping center. It looks like it might harbor amphibians and other vernal pool dwelling creatures, but this one is fairly void of aquatic life. It does have some nice mature ash trees and box elder. 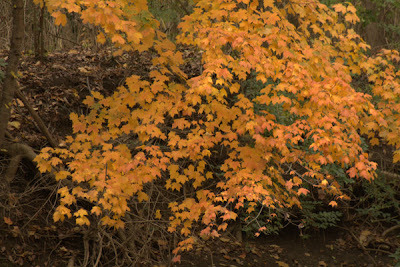 Along this stretch of the river, the colors are mostly light oranges and yellows. 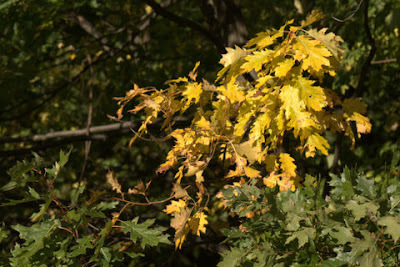 The closest to red we get is from the very few sugar maples on the opposite bank of the Olentangy. 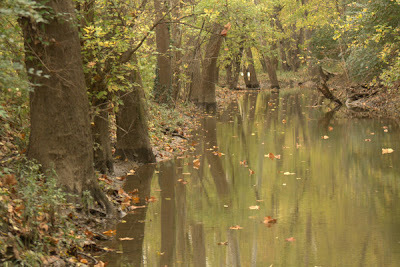 I dropped down a bit to the floodway, checking out one of my favorite areas of the park. This channel is typically dry during the summer, but fills quickly when we have heavy rains. White mulberry trees, no higher than fifteen feet, gave the park splashes of yellow. This tree, Morus alba, is, unfortunately, not native. 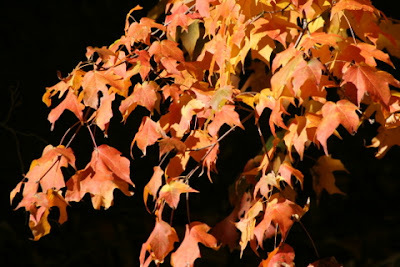 Sycamores and red maples are fairly amazing trees. They can take the inundation of the floodwaters with regularity. Their roots can become exposed, creating quite a trip hazard. They remind me of snakes. 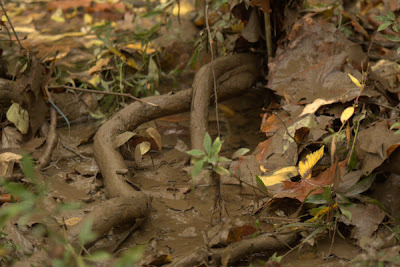 I'm always on the lookout for a nice black rat snake, which surely would have inhabited this strech of the river at one time, but I haven't seen any, and I'm guessing that the area has too many people, too many predators, and too much disturbance to harbor Ohio's largest snake. 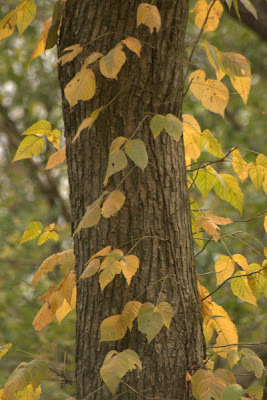 For those from Minnesota, our Ohio poison ivy grows on trees. 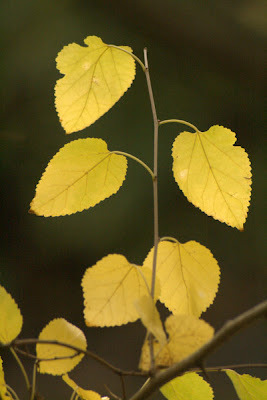 It also can put on nice show in the fall, with its leaves turning yellow, or sometimes even red. Speaking of poison ivy, I don't know how many people have told me that they were cutting up a tree and got poison oak right from the tree. Thats right. Poison oak. There is NO PLANT in Ohio named POISON OAK! NONE! (Don't believe me? 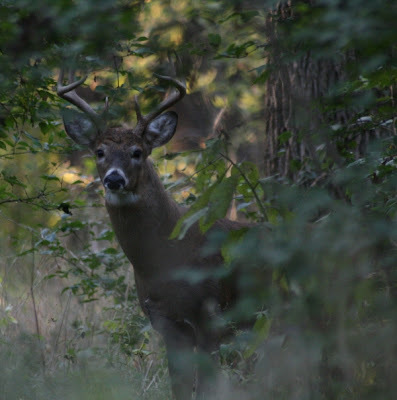 visit the USDA site for a range map. We have poison Ivy and Poison Sumac, and the latter only grows in bogs, fens, and swamps. As I was walking around the floodplain, I found this rather interesting rock. 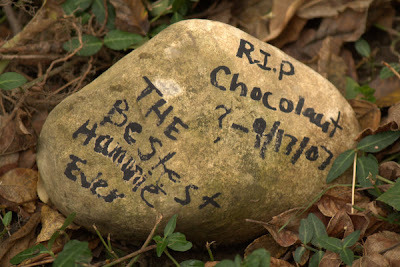 At first I thought it was some gang tag graffiti, but I quickly realized that I had just desecrated the burial site of the best hamster ever, the famous "Chocolaut." Welcome to the city. That kinda left me shaking my head. Why not bury your hamster in your own back yard? Anyways, I was getting tired and thirsty-- it was time to head home. 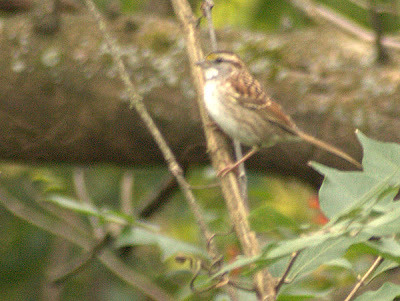 On my way back, I picked up this white throated sparrow. Good to see these are back for the winter. I have missed them and their old Sam Peadody whistle they make. 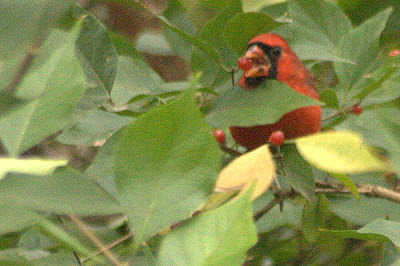 And finally, I was watching this cardinal in some invasive Amur honeysuckle, and sure enough, this darn thing ate one of the berries. I really hadn't seen this before. Everything I have read about honeysuckle berries points out how they are a low quality food source for birds. Full of sugar and low in lipids. Perhaps this cardinal has developed a bit of a sweet beak??? 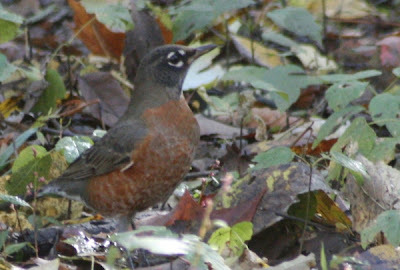 This afternoon, I got off work a bit early, and decided to take a few pictures of birds around my neighbor's feeder. 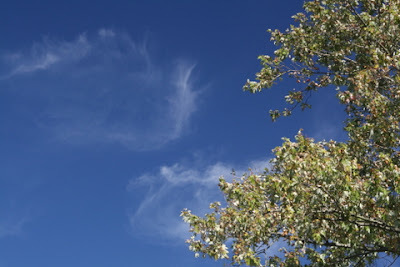 I pretty much struck out with that venture, as I just couldn't hide behind the catalpa tree without them seeing me. Oh Well. Sure enough, I went to the backyard, photographed a squirrel running down the top of the fence, and looked at the goldfish in the pond for a bit. 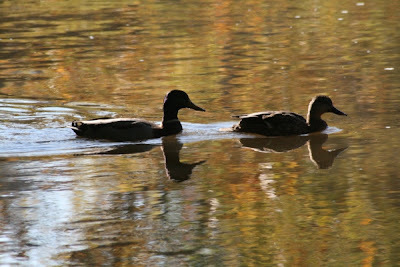 A sudden flash of brown streaked across the pond with a flick of light. It was a dragon. What was it? 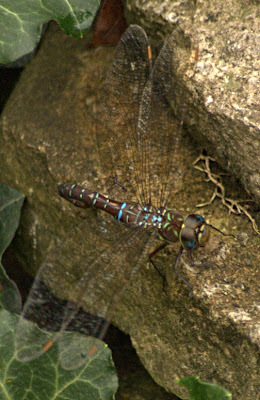 A fawn darner? 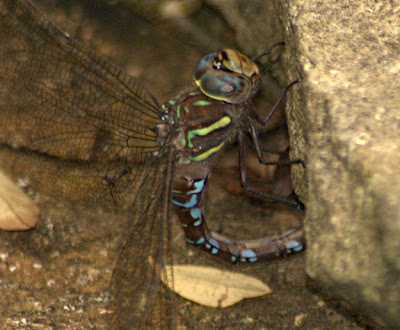 It stopped on the limestone ledge, and then started curling its abdomen underneath the rock. 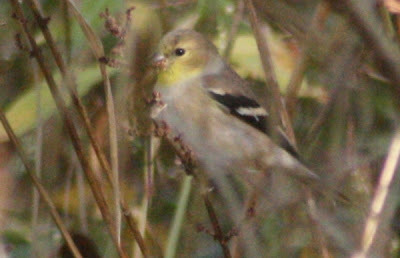 A female! I had my camera, looked through the lens, and sure enough, it was one of the mosaic darners, a beautiful group of dragons that can be observed in the fall throughout Ohio. 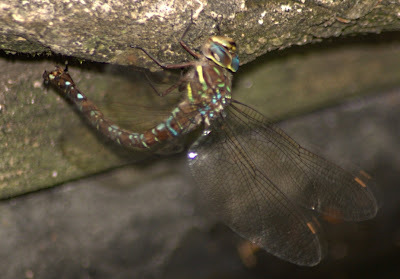 But today was gray, and I wasn't expecting to see any odonata, let alone one I have never seen before. Maybe the female's eggs will hatch? Sometimes I wish I could get rid of the fish, removing predators that might eat the little dragonfly nymphs once they hatched, but I don't think the landlord would approve of that idea. Oh well. Maybe some will make it anyways? Pictures to come later this evening! Update: Did I mention how beautiful this insect is? 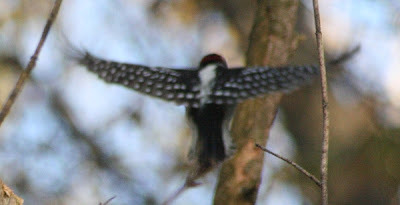 I couldn't really see the bright greens and blues while it was flying (it was all a brown blur), but once this female landed, her colors shown bright. What a spectacular animal. In the following photo, you can see the females black, awl shaped ovipositor scraping the bottom of the limestone. This dragon may have been gone in sixty seconds, but it made quite a lasting impression. 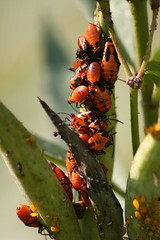 These milkweed bugs were huddled together on an ornamental milkweed in New York's Central Park earlier this month. Lower in in the photo you can see yellow aphids sucking away on the milkweed sap. 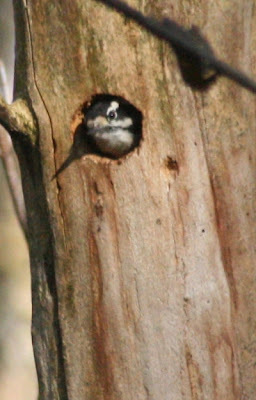 There is plenty to be seen in NYC nature-wise, even though most of the city is a "concrete jungle." Today I'm sending a blog post through Flickr, yahoo's online photo sharing site. 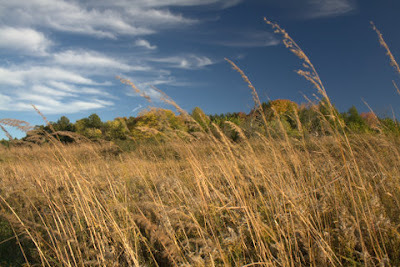 Here is a photo of Big Bluestem grass from Slate Run Metropark. 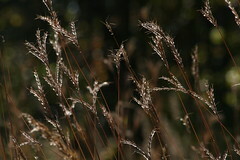 Big bluestem is an important component of the tall grass prairie, and is native in Ohio. 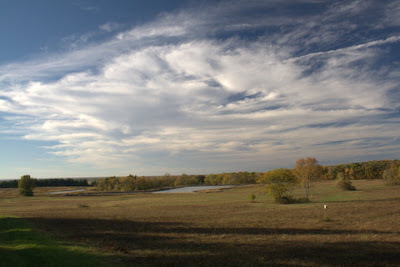 However, it has been planted across the state for grassland habitat creation projects, as has been done at Slate Run. This past Sunday, as Megan and I were walking along a lichen covered split rail fence at the Slate Run Farm, we encountered this rather nasty looking bug. 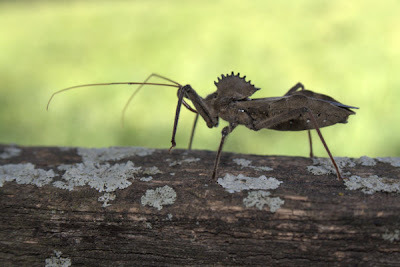 It turns out that it was a member of the assassin bug family. 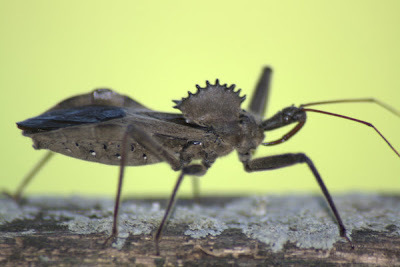 A quick look in the Kaufman Field Guide to Insects of North America led me to the Wheel Bug, Arilus cristatus. There are two interesting things about this insect besides in huge size (Its body alone was about an inch long, and it holds itself quite off the ground). First is that really interesting comblike projection on its thorax. I'm guessing that is where the scientific name cristata comes from, since cristata is Latin for crest or comb. Thank you University of Notre Dame Latin Dictionary and Grammar Aid. You may recognize this root from scientific plant names like Carex cristatella or even Iris cristata. The second extremely interesting part of this creature is that long beak or needle like projection extending backward underneath its head and neck. In the Kaufman guide, it says that assassin bugs can use this to inflict excruciatingly painful defensive bites! Fortunately, I was spared. An interesting bug indeed. I've posted several of my photos on Flickr. 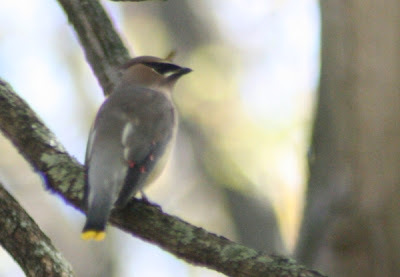 I like taking pictures, but if they sit on my computer unseen, what good are they? Hence, Flickr, and online photo sharing website. Check out the little photo box on the right and please feel free to comment on any photos that you enjoy. I haven't been alive long enough to remember the grass green, quarter sized turtles that used to be sold at "five and dime stores." Larger juvenile and adult sizes of these turtles are still sold today at pet shops. Over the years, thousands if not millions have been released into the wild, and almost everywhere I go, I see a red eared slider. 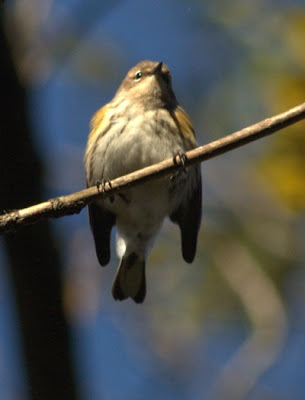 In Ohio, it is thought that we may have had some northern populations disjunct from its typical native North American range in the Mississippi River system, but now, you can see them in many lakes and rivers across the state. 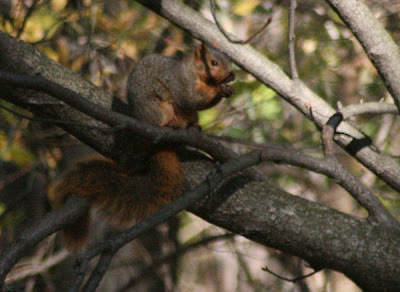 Other countries, and some states, like California, consider them an invasive species. I've not read anything that suggests they are reproducing in Ohio, or if they are outcompeting native species for food and basking spots, but they are definitely present here in central Ohio. 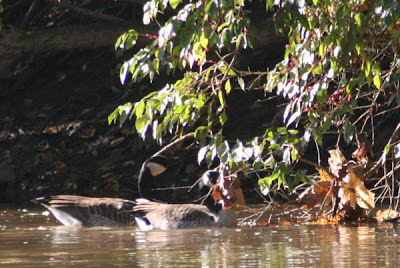 I was inspired to do this writeup after seeing a dozen or so sliders in Manhattan's Morningside park, then this past Saturday, I observed and photographed a large individual in the Olentangy River. 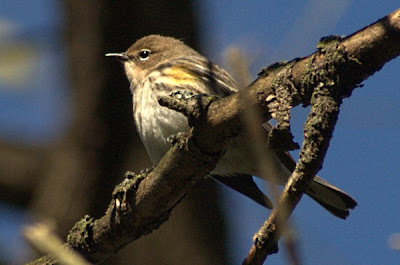 Then on Sunday, Megan I saw another slider at Slate Run Metropark. Why are people worried about this turtle in other countries? Well, they can outcompete native species for both food and basking spots. Here we have a native common map turtle and the red-eared slider in the Olentangy from this past Saturday. 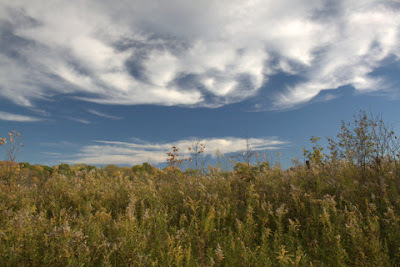 And here is yet another slider from Slate Run Metropark, just south of Columbus. I'm guessing this one was "dumped" into this small pond, just off the parking lot, by someone that just didn't want the hassle of keeping a pet turtle. The giveaway is its shell. When turtles are raised in the wild, their shells grow very smoothly and don't have any "pyramiding" on their shell. Look closely at this turtle's shell, and you can see how each scute (section of the shell) is raised somewhat. I guess the point here is to really think hard before you consider purchasing a red eared slider as a pet. There are plenty out there to adopt, and please, don't release these animals into the wild. They are now considered an invasive species in Europe, Asia, and Australia! The weather this past weekend was awesome. I had hoped to get a few pictures up sooner, but I had a little camera card mishap (thanks to Google Picassa) and spent most of last night recovering about 200 raw photo files. Fortunately, I was able to get all the images off the card thanks to Zero Assumption Digital Image Recovery.